We are excitedly getting ready to have our family over on Thursday for Thanksgiving. As part of our preparations we made a new clothespin wreath, that we will use as a thankful wreath on Thursday. I have traced and cut out copies of the girls hands on brown, yellow, red and orange construction paper. Everyone at our Thanksgiving will be invited to write or draw what they are thankful for onto one of the hands. We will then clip the hands onto our wreath! 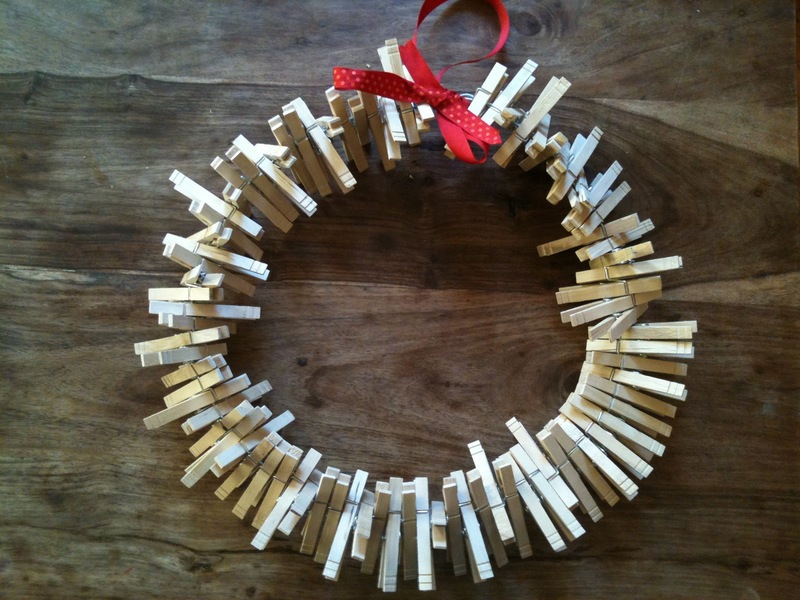 When Thanksgiving is over we will have one clothespin wreath that we will use as an advent calender taking one piece of paper off each day. Our other clothespin wreath hangs on our front door and we use it to hold and display all the holiday cards we receive. The clothespin wreath is very easy to make and both the Bee and Bean helped in making this one. We started with two large packs of wooden clothespins. You can find clothespins at any supermarket or dollar store. I then took a wire hanger, unraveled it and bent it into a circle. Wrapping the ends together to hold the shape. 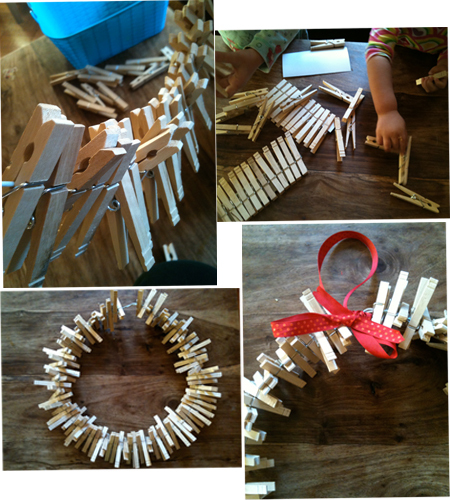 I then dumped out all the clothespins, which the girls loved playing with. We begin clipping the clothespins onto the wire. You want the clips to hang from the center hole so that you can still open and clip something into the clothespin. It took approximately 90-100 clothespins to cover the entire wire hanger. I then took a ribbon and tied a loop to hang the wreath by. Thats so beautiful!! I love that you will clip on the I am Thankful for... hands.Really really special.